Our rich knowledge and experience designed this new model embroidery machine with precise parts with fine material by CNC machines. You will get a machine with our experience, quality and service. 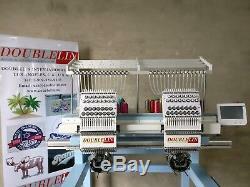 Embroidery machine, 2 heads compact. 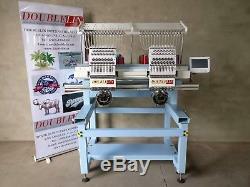 Yes, double your capacity and choose all new design Doublelin DLCF-1502 610350 two heads 15 needles compact embroidery machine, embroidery area 2413.8 inch per head. Embroidery on caps, T-shirt, finished garments, shoes, cylinder type items, flat type items and various others. Demo request 909(859)9303. 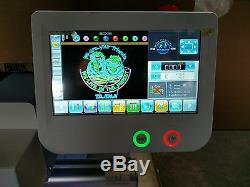 World first full size 2 heads portable compact embroidery machine. This is full size 2 heads compact machine, two biggest size garment hoops can be fit on machine same time and sewing same time. New design with no interfering areas on machine for embroidery (improved from old type compacts). New design of electronic parts for lowing the failure rates (improved from old type compacts). New design with common parts will lower the maintenance cost (improved from old type compacts). Machine contains everything you will need for opening business. One sit free training in our office in Los Angeles or at your place through the internet video. On-site installation and training at your location U. Machine speed up to 850 rpm, touch screen with build-in lettering software. With networking software, full function digitizing software, 22+ thousand embroidery designs, machine table, machine stand with table. Forget the old type compact and choose this totally new design compact embroidery machine. DoublelinDLCF-1502 610350, Two heads, 15 needles. No parts as option, the price including all the parts list below. Garment hoop holder 2 sets. Garment hoop size 3.5 inch 4pcs. Garment hoop size 4.7 inch 4pcs. Garment hoop size 5.9 inch 4pcs. Garment hoop size 7.9 inch 4pcs. Garment hoop size 11.411.4 inch 4pcs. Garment hoop size 17.914.5 inch 2pcs. Heavy duty cap hoop driver 2pcs. The item "Commercial Embroidery Machine, 2 heads Compact, NEW, New style, Both head full size" is in sale since Monday, July 11, 2016. This item is in the category "Business & Industrial\CNC, Metalworking & Manufacturing\Textile & Apparel Equipment\Embroidery Machines". The seller is "doublelininternational" and is located in Ontario, California. This item can be shipped worldwide.